We broke camp like a well-tuned sixteen-cog machine. I paused for a moment to watch everyone moving together, doing a complex job smoothly and quickly. The expedition had been together for almost two weeks. We had just three more mornings to go. An aphorism came to mind: when we work together, we are more than the sum of our parts. It doesn’t mean much when you read that on a poster, but it is impressive when you see it happening. We were off by 8:20 am, with 13 miles of quiet water separating us from Lava Falls. With a swift current and no headwind, the miles went by quickly. We passed Gateway and Mohawk Canyons, which sit across from each other and were begging to be explored, but not this time. We would go 25 miles today. We were like tired horses that sprint when they get close to the barn. It was a hypnotic view. Most of what I know about subatomic physics comes from Marvel Comics, but I have heard of wave-particle duality, the theory that every elementary particle exhibits the properties of not only particles, but also of waves. Maybe this is why looking at waves is such an effective way to relax. Our little human brains are getting in sync with a fundamental mystery of the universe. I know what you’re thinking, and the answer is no. No one brought any marijuana on this trip. 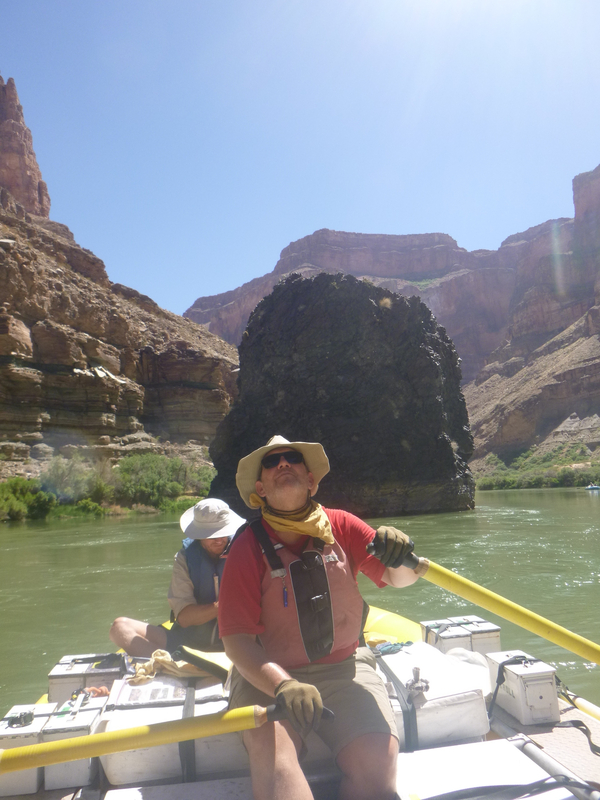 Pedro started rowing again; we turned a corner, and the canyon widened dramatically. 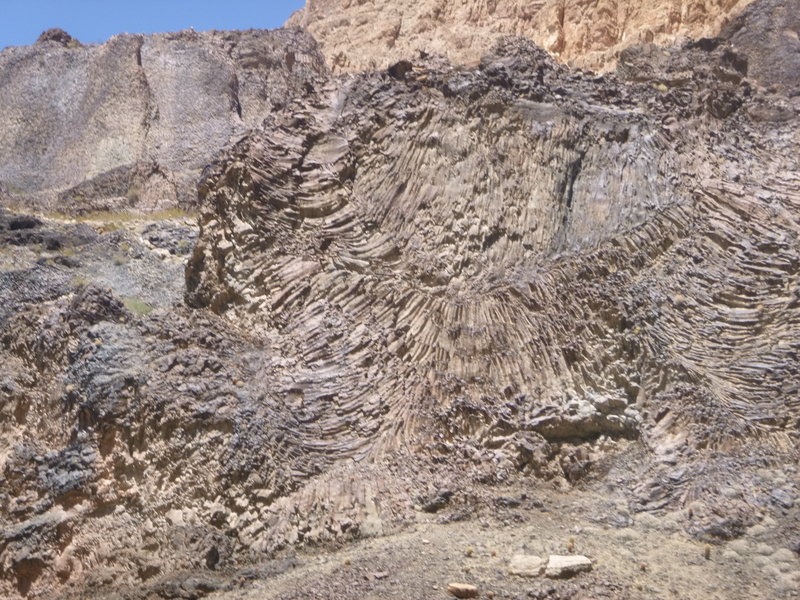 We floated past a huge rockfall on river right known as “The Red Slide,” where a cliff of Supai sandstone slumped onto a beach (click here to see it in 3-D!). Shortly afterward, our world changed again when the Uinkaret volcanic field appeared. Suddenly the rocks at river level changed to basalt – they were black and jagged like congealed floor adhesive, looking as hot and nasty as a rusty old iron skillet. Barrel cactuses were growing in the black cliffs, despite the apparent absence of any soil, and I wondered how long their tap roots had to be. 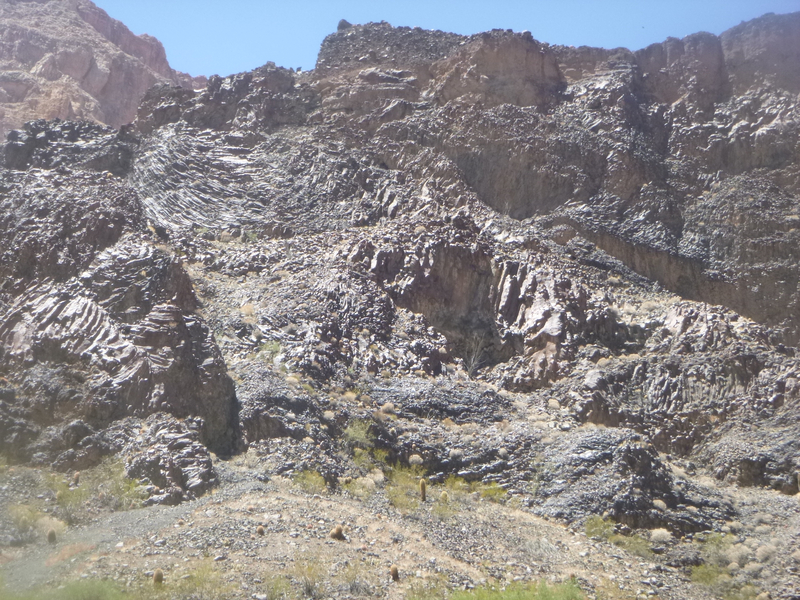 The geologic story of this part of the canyon would make a great sequence in a Hollywood superhero movie. 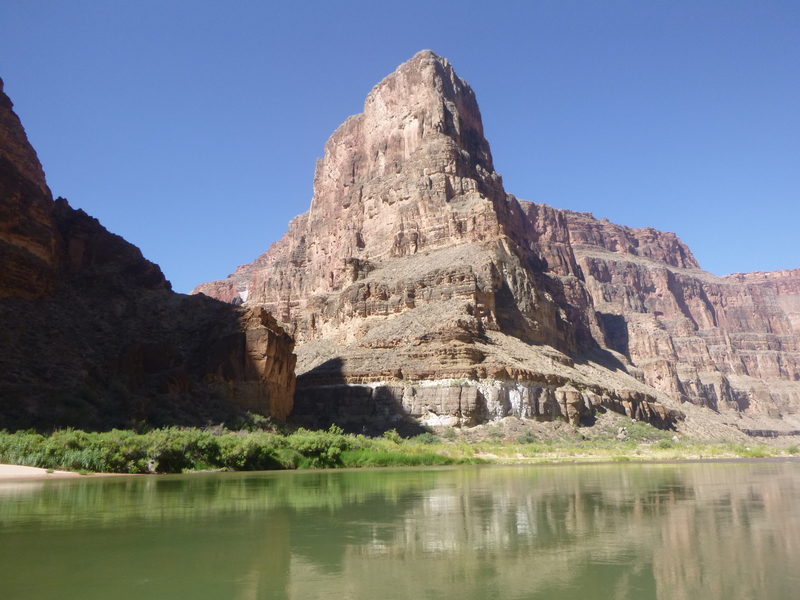 Beginning about 750,000 years ago, when the Grand Canyon already existed in something like its present form, a series of lava flows along the Toroweap fault oozed into the canyon. The cooled lava formed dams that backed the river up for hundreds of miles. When the river overtopped that barrier, it cut through the porous volcanic rock relatively quickly and made the channel we were passing through. 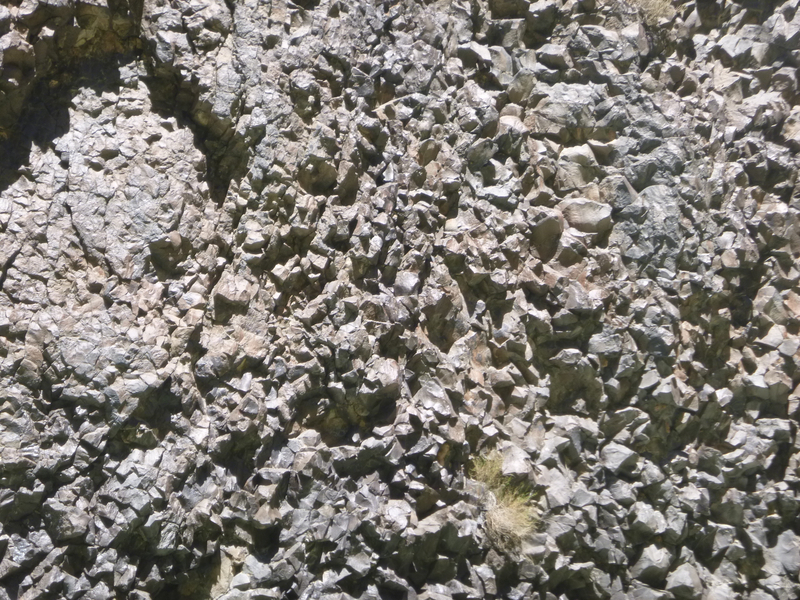 In geologic terms, the basalt cliffs we were seeing were babies. Just think of the steam, noise, and general mayhem that must have ensued when, as John Wesley Powell wrote, “a river of molten rock ran down into a river of melted snow.” Basalt cools into columnar and crystalline shapes, and the faster it cools, the bigger the shpes. We floated through fantastic, almost floral patterns in the cliffs. It was an unbelievable rock show. Around noon we came upon a column of basalt in the middle of the river. This was an important landmark called Vulcan’s Anvil, which (I am told) is the neck of one of those basalt flows. Because it is slightly harder than the surrounding rock, this rock column is eroding slower. The rock wasn’t always named after Vulcan: early prospectors called it “niggerhead.” Racism in 19th-century place names wasn’t unusual. Racist ideas are buried deeply in our language. A century ago lots of things in America were named “niggerhead,” including a common species of cactus that looks a lot like this rock. 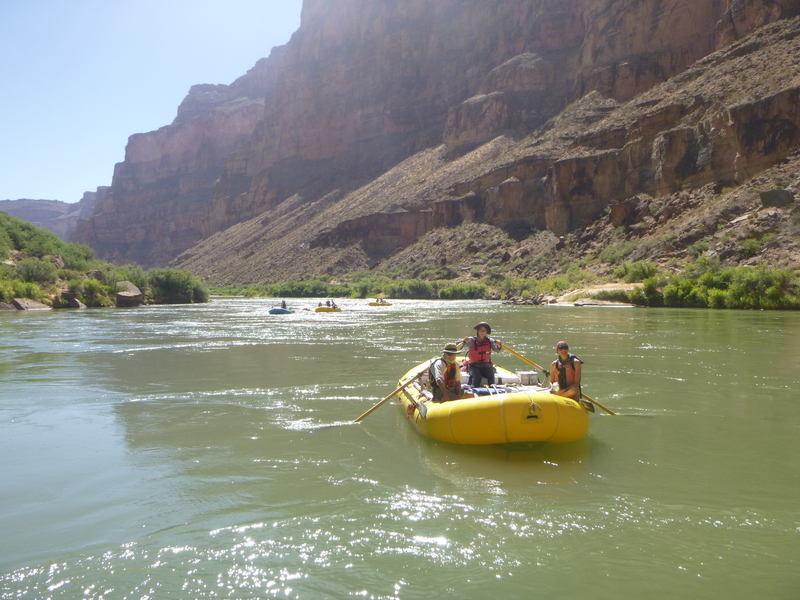 Vulcan’s Anvil is one-and-a-half miles upstream from Lava Falls, the roughest, most famous rapid in the Grand Canyon. As we approached it, the water pooled and became unusually quiet, making it possible to discern a low roar in the distance. The moment had arrived. Several months before we set out on this trip, Tania and I had lunch with Pete and Christie. We didn’t know what we were getting into. They kept talking about Lava Falls. They said it was The Big One, the one to watch out for, the one to worry about. 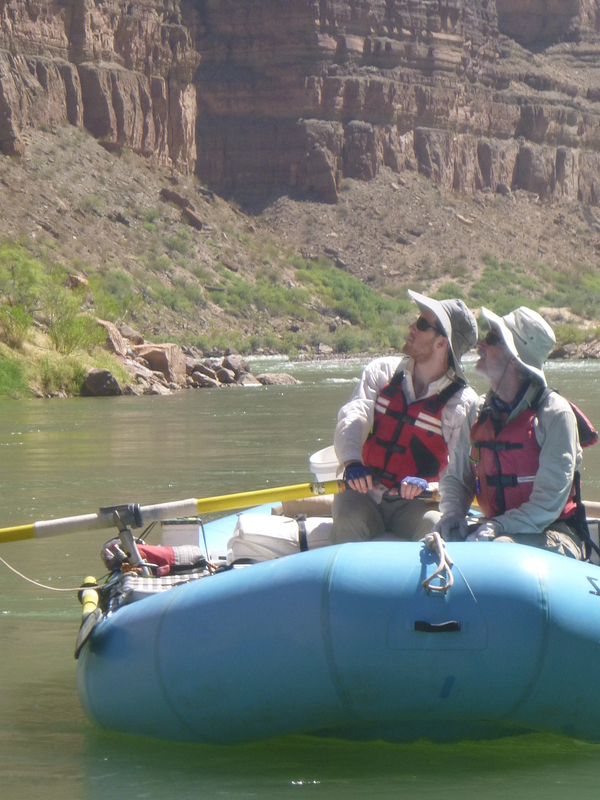 Our experience with whitewater was limited and mostly on Eastern rivers, where the rapids are usually gentler and shorter. So we stayed up nights thinking about the Colorado rapids and watched YouTube videos of Lava Falls and had lots of anxious, inconclusive conversations about what was going to happen and how we should prepare for it. Our worry and anticipation was kind of silly, given the number of people who go through this rapid safely every year, but there you go – fear can make you act silly. Now it was time to face it. We started, of course, with the mother of all scouts. It took ninety minutes for us to scout Lava Falls, which is ranked 9 on a scale of 10, and Lower Lava, just downstream, which is ranked 4. It took another fifteen minutes for the six rafts to run the rapids safely, and a half hour more to regroup in an eddy just below. At the bottom of the big rapid, just after Pedro had once again flawlessly led us through the madness, I made a short movie of Tim McGinnis bombing through the base of the falls (see top of this post). We all turned downriver and ran Lower Lava, which seemed like a koi pond now, and then pulled over on river left for the traditional post-Lava celebration. A lot of high-fiving, smiling, and exclaiming. We might have passed a bottle around. And then, a nice surprise. Bridget Tincher and Susan Sharp — the women in the video above — pulled over to join us briefly and trade e-mail addresses. I’m not going to try to describe what it felt like to run Lava Falls, except to say that I did not find it the scariest or roughest ride of the trip. It felt like being inside of a washing machine for 15 seconds. Rod, who has been down the river nine or ten times, said that we hit it on a relatively quiet day. And looking at videos of other runs, I’d say he was right. We started rowing again around 1pm and headed back into basalt-a-palooza. Pedro was still rowing, but he was also chanting and laughing at silly jokes; we were all intensely relieved, and before long we started getting punchy. This was when Jai stepped up. She became the chief instigator for water fights that spread from raft to raft. Pedro generally stuck to splashing with oars, but at times our raft was provoked enough to use a white plastic bucket. As usual, though, Rod had the right equipment close at hand. He busted out a large syringe-style water gun, easy to build and quite effective at distances of 25 feet or less, and blasted away at us. It was so hot that we begged for it. We passed the Whitmore Helipad, where about 11,000 commercial rafters get picked up or dropped off every year. I’m glad I wasn’t doing it that way. 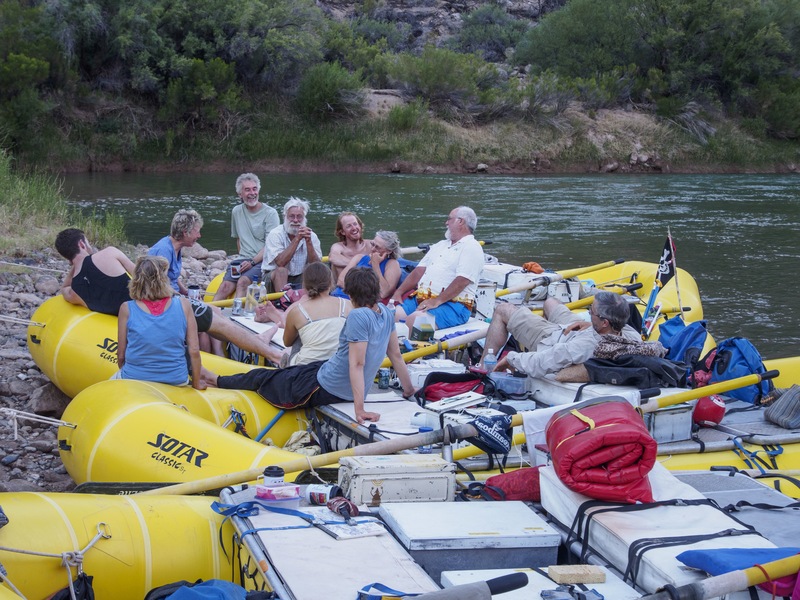 Imagine that you have been on the river for a week or more. You run Lava Falls, and an hour later you get on a helicopter. A few minutes after that, you land at a private airport. A few minutes after that, you get into a small plane. A few minutes after that, you are dropped off at McCarran Airport in Las Vegas. Sometimes rafters get on their commercial flight home without even taking a shower. Tim did that the last time he was in the canyon, as an 11-year-old boy. I think taking a chopper out of the canyon would be like skipping the last act of a play, and leaving just after the dramatic climax. If you packed this experience it into a shorter amount of time, I don’t think it would sink in as deep. 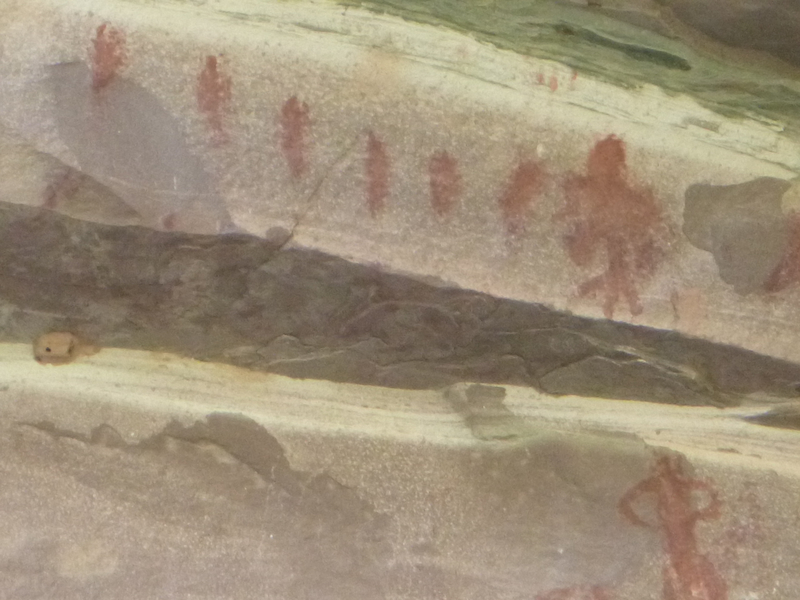 We pulled over on river right to see the Whitmore Canyon petroglyphs, which Rod said were relatively recent except for a few older, cruder figures scratched into the rock. It felt good to walk. 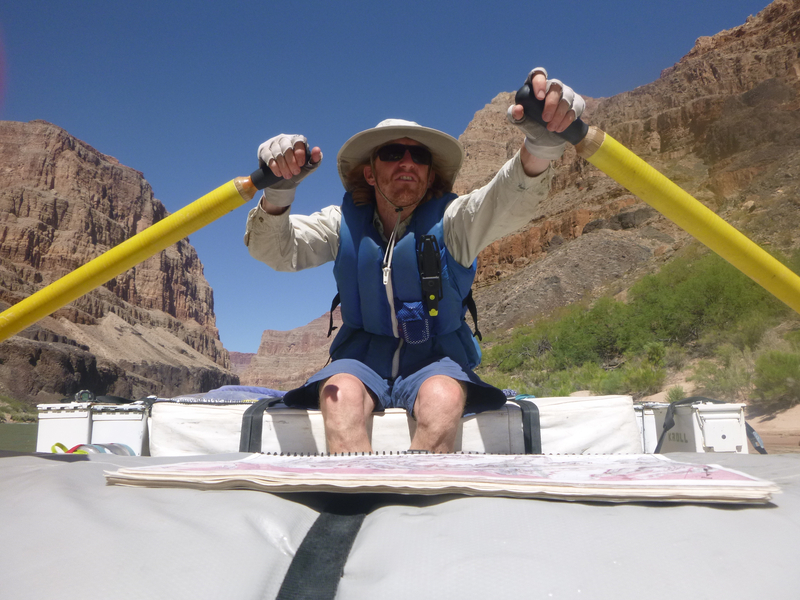 Then Pedro gave me the oars for the last three miles. By 4pm we were in camp. 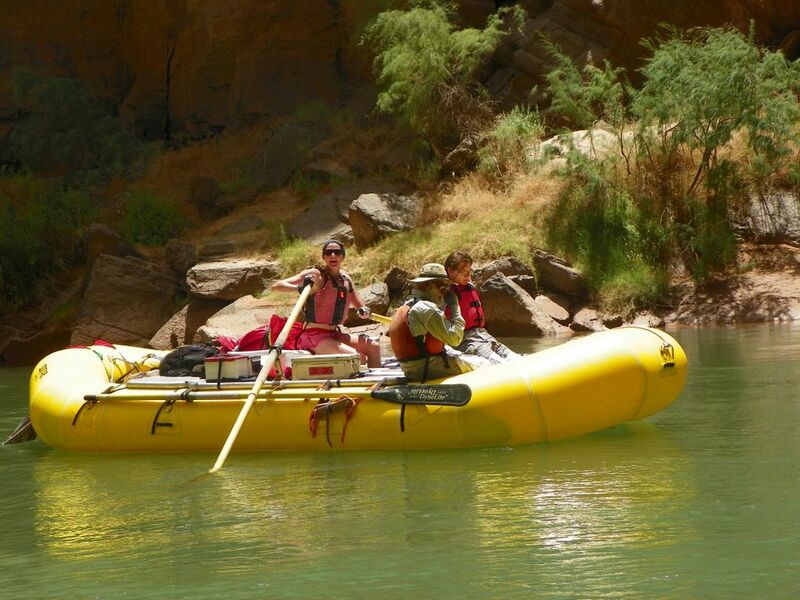 We had just 26 river miles left in the trip, no rapids ranked above six, and two full days left to do it. Our camp was also in full shade when we pulled into it. No wonder it was called Fat City. We continued to celebrate, and the Dinner Dream Team (Mel assisted by Jai and Tim, with Baer leading the dish crew) put together some delicious chicken and sausage gumbo. It’s amazing how good canned meat can taste after a long day outdoors and a couple of beers.